At Earthouse we are always looking to extend our knowledge of materials and work hard to develop our expertise. We also like to try completely new things! 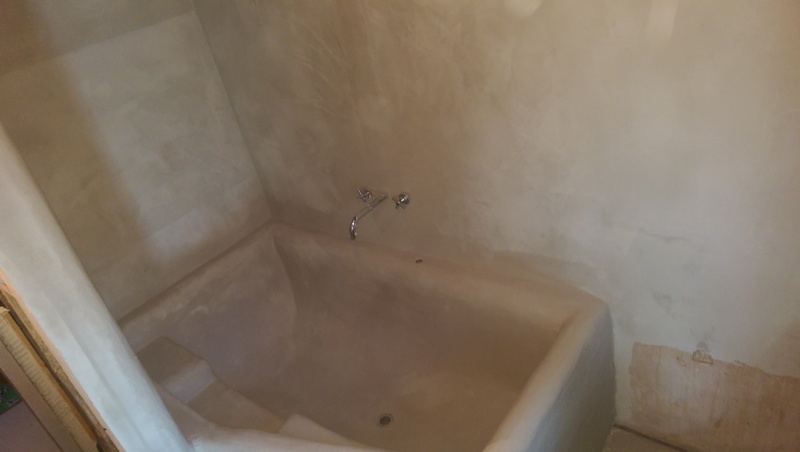 In 2014 we went on two courses; the first was Tadelakt Plastering and the second was Venetian Plastering. 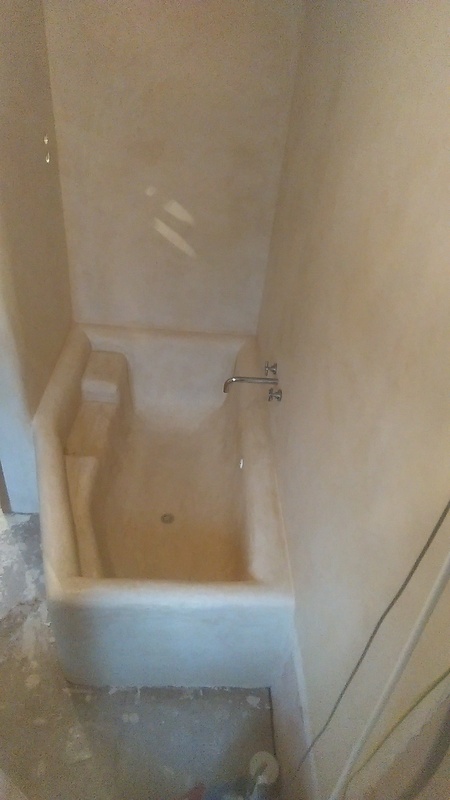 Tadelakt is a polished plaster which has its roots in Morocco. Due to it’s fantastic water repelling qualities it is great to use in bathrooms and can even be used to create a wet room. It has a beautiful sheen once fully polished and can take a wide variety of colours. As well as creating our own bathroom, we have also created a beautiful bedroom feature wall. The photos above show the stages we went through to create the structure and shape of the bath. The bath is built from breeze blocks and waterproof cement. 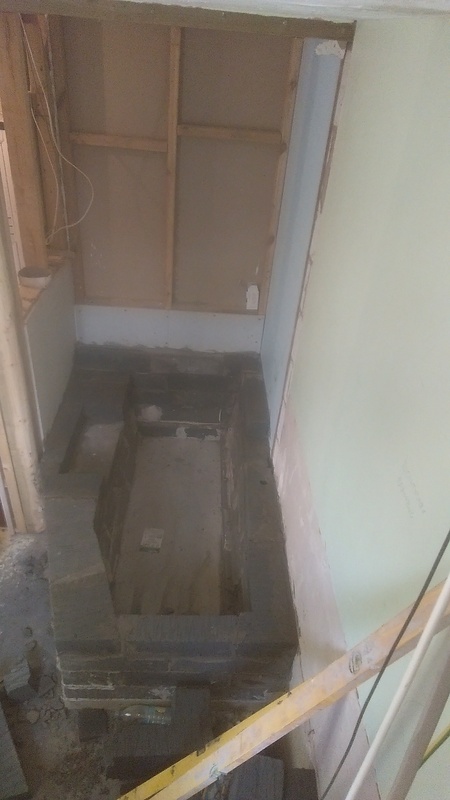 We wanted the bath to sit in an awkward shaped alcove so that we could make the most of the space in our bathroom area. 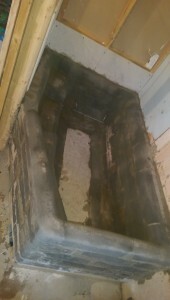 This photo shows the baths with inbuilt bath seat, a very simple plug and tap design. 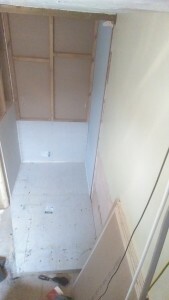 The shower is positioned in the recess and luckily does not require a shower door or curtain. 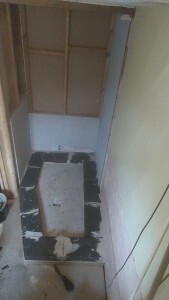 As Tadelakt is water repellent there is no need for tiling etc. The photo above shows an alternative view of the bath and surrounding walls. 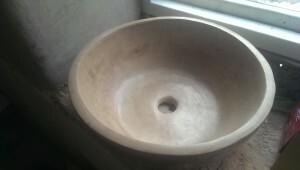 Following the application of the plaster, it is polished with a polishing stone. 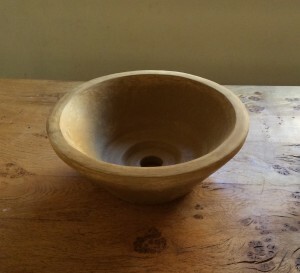 To finish the bath is waxed with Karnuba wax. We chose the pigment to have a yellowy-cream colour finish. Other colours can be used. All the bathroom walls are now finished in the same colour Tadelakt – no damp issues at all! These basins were created using a terracotta planter and applying layers of the plaster then polishing. Tadelakt is incredibly versatile and can be used in a number of ways.